It is important to get valuable information before visiting Uganda & Rwanda for gorilla trekking. Your gorilla safari will be memorable after noting down all this information from this mountain gorilla trekking guide. Currently it’s possible to see the gentle giants in three countries which are Uganda, Rwanda and Congo. With the total population rising to over 1000 individuals (As of 2019), conservation of these animals and their environment plays a vital role. Getting to see the mountain gorillas in a close range is a memorable and lifetime experience. Did you know Gorillas are known to share 98% of their genetic composition with humans? The males are known as silver-backs because of their size and the silvery effect on the soft back hair takes on as they age. Mountain gorillas are a subspecies called Gorilla Beringei but those which are normally found in Zoos originate from the lowlands of western Africa. 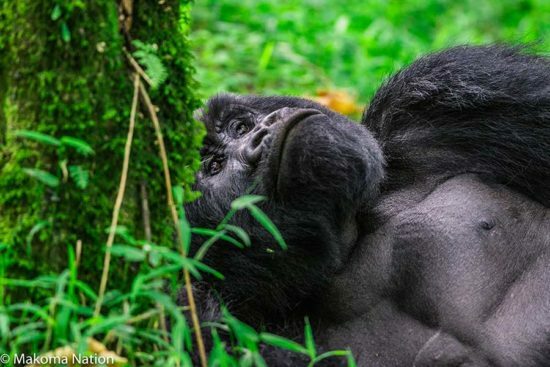 The Gorilla Beringei can be found in the Parc Des Volcans – Rwanda, Virunga National Park in DRC and Uganda’s Bwindi Impenetrable forest and Mgahinga National Parks. Uganda is bigger than Rwanda but the journey to see the gorillas in Bwindi could take a full day or less. The forest has about 12 habituated Gorilla groups each available for tracking. Rwanda is a smaller country and the drive to Volcanoes national Park where the gorillas live is shorter. The roads to the park pass through vast tea plantations, terraced hills, and thick clusters of trees before hugging the steep slopes of the forest with amazing views. 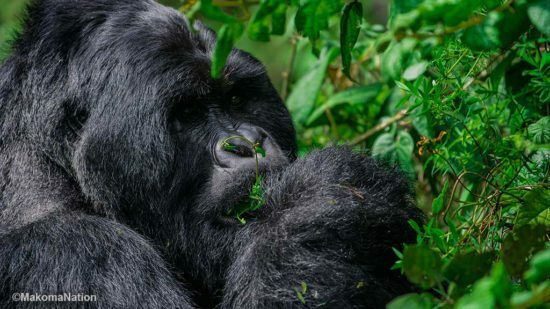 However there is a difference in the gorilla permits price, with Rwanda’s at US $1500 and Uganda’s half the price as of April 2019. The experiences in both Uganda and Rwanda are quite the same and your choice shouldn’t be based on who is better. The best time to go for a gorilla trekking safari is between June to September and the period from December to February. It is much easier to track the gorillas during the drier months and the roads are not too slippery like as it is the case when in the wetter months. Also December, June and August are peak seasons for most safaris in East Africa so you plan for the other months when it’s less busy. Before your trip, it’s important to know the perfect clothing to wear for the Jungle and the details are being shared in this gorilla trekking guide. First and foremost solid, reliable walking shoes or boots are a must plus some long decent socks and long trousers. During the trekking, you will be asked to tuck in your pants /trousers into the socks while you pass through thick jungles. On some days while on the road, a hat and sunscreen are important to keep you away from the burning sun. Long sleeved t-shirts are encouraged to protect you from the vegetation that could harm your skin. Rain is also possible anytime of the day while in the jungles so carry along a raincoat / rain jacket. You will also want to come with a backpack to carry your other stuff including bottled water, snacks, your cameras and binoculars. With this gorilla trekking guide, you will learn that most visitors don’t need to be extra fit for the gorilla trekking experience. However having a certain level of fitness is an advantage if planning to visit the Bwindi or Volcanoes Park. Once you set your eyes on the giants, you will obviously forget about the hiking and journey – such a thrilling encounter. Each trekking group is limited to a certain time with the gorillas each day which helps in minimizing the risks of disease transmission to the animals. In-case of any sickness or you get a contagious disease before tracking, it’s best to stay behind. An alternative visit can be arranged for you or a refund can be arranged. It’s advised not to cough or sneeze when near the gorillas, or you could turn your head away and cover your nose and mouth in order to minimize the spread of bacteria or germs. Do not leave any rubbish littered within the park e.g. food wrappers or empty bottles. Some-times you might feel the need to visit a toilet while inside the park however your guide can help to dig you a hole then fill it when finished.